A low growing species Artemisia stelleriana is commonly called the ‘Beach Wormwood’. 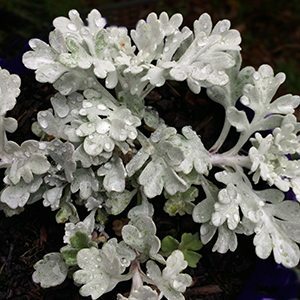 Grown for the very attractive silvery grey to white foliage this makes a great ground cover plant for a sunny position. The common name of Beach Wormwood comes from its ability to grow in coastal conditions. It tolerates salt as well as light frosts. Excellent when planted in the general garden border, near the front. Also suited for mass planting as a ground cover plant. Simply prune back the old growth right to the base of the plant in winter. Good drainage is essential, especially in winter. A number of forms are available, however, very similar in our eyes. Easy by division of established clumps, also possible from stem cuttings taken in spring. Common Names – Beach Wormwood, Hoary Mugwort. Climate – Temperate climates to Cool Temperate. Soil Humus – Humus rich well drained soils. Position – Part shade, to full sun. Flowers – Insignificant, although they do appear on tall stems.